Debbie Says: You can use chunky or smooth peanut butter, whichever suits your liking more. The topping is optional. For variety you can use both flavors of chips or just use one or the other. 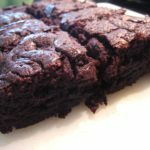 If using just one flavor, you’ll need to double the amount. In a large pot, combine the corn syrup & sugar. Heat over moderate heat until bubbly. Remove from the heat. Add peanut butter & stir until melted & combined. Stir in Rice Krispies until well blended. Using the back side of a greased spoon, spread the mixture into a 9"x12" pan or dish. In a double boiler, heat the chocolate & butterscotch chips until melted completely. 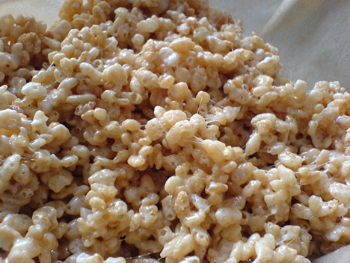 Remove from the heat & spread evenly over the Rice Krispie mixture, or drizzle in creative patterns. Melt caramels & 1/3 c. evaporated milk, stirring constantly. 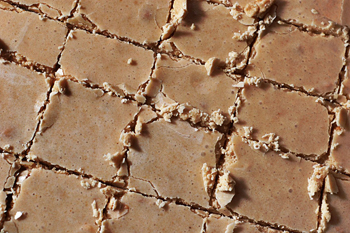 Mix by hand cake mix with melted butter & 1/3 c. evaporated milk; add nuts to mix. Place approximately 2/3 of cake mixture into an ungreased 9″ x 13″ pan. Press evenly into bottom of pan. Bake for 8 minutes at 350°F. Sprinkle with chocolate chips while hot & pour melted caramels evenly over top, being careful not to get caramel close to the sides of the pan. Crumble remainder of cake mixture over top. Bake 18 minutes at 350°F. Do not overbake. Cream the butter & sugars. Add the eggs & vanilla. Combine the dry ingredients & stir into creamed mixture. Sprinkle in chocolate chips. 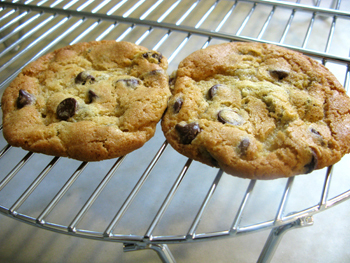 Shape the cookies into little round balls & place onto a greased pan.